Section 7(2) – The Management Authority must prominently display a Protected Area Notice at every entrance to a recreation area indicating (a) the opening and closing times of that recreation area or nature reserve; and (b) any internal rules made by the management authority in relation to that recreation area or nature reserve. 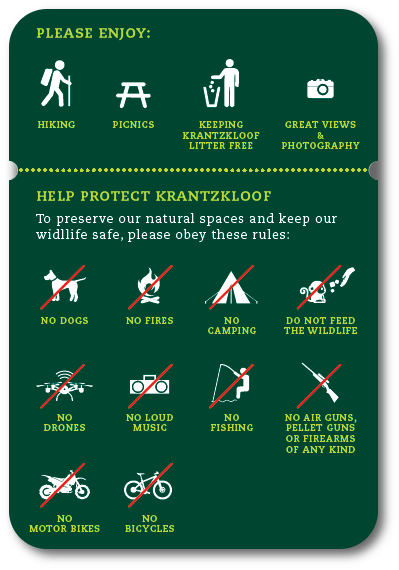 No person may enter or leave the Krantzkloof Nature Reserve at any place other than through the designated points of entry or exit or enter, leave or travel in the nature reserve at any time other than the times determined by the Management Authority. Any person who enters the Krantzkloof Nature Reserve must display or be in possession of proof of entry in a manner determined by the management authority. No person may overnight, camp or reside in the Krantzkloof Nature Reserve. No person may allow any dog, cat or any other pet belonging to or under the care of that person to enter into the Krantzkloof Nature Reserve. No firearms allowed in Krantzkloof Nature Reserve. interfere with any management authority staff member undertaking his or her duties. land in the nature reserve using any aircraft. drive a vehicle off-road or off designated roads or tracks, except in an area set aside by the management authority for that purpose. is guilty of an offence and liable, in the case of a first conviction, to a fine not exceeding R5 million or imprisonment for a period not exceeding five years and, in the case of a second or subsequent conviction, to a fine not exceeding R10 million or imprisonment for a period not exceeding ten years or in both instances to both a fine and such imprisonment. Sections 8, 19, 20 to 26, 33 to 37, 42, 45 to 48 and sections 51 to 54.